“I have this theory that if one person can go out of their way to show compassion, then it will start a chain reaction of the same. People will never know how far a little kindness can go.” Rachel Scott, the first victim of Columbine tragedy. About eight months ago I decided to really step outside my comfort zone. I began religiously writing blog posts. For those of you that really know me, you will understand that I’m actually quite insecure. On the outside I’m a happy-go-lucky type of guy and I express myself in an energetic way. Most people would call me confident, and others possibly arrogant. These are actually far from it. I play a good game, but on the inside I’m quite different. I’m insecure. So when I decided to start writing and sharing my blog posts to the world you could imagine that it was a giant leap of faith for me. But I cannot help but think I was put on this earth to do more than what I’m currently doing. I lie awake at night thinking about how I can make a difference in this world. I get to work in the greatest profession one could imagine. I get to inspire people each and every day. I’m sure some days I do better than others, but the opportunity presents itself with each new sunrise. My conscious however, continues to tell me that I need to do more. So I’ve turned to writing. Over the last eight months I have written over 20 blog posts. Most of these posts have been attached with a theme of motivation or inspiration. Some were written to challenge people to think better and to do better. Others were written as tributes to those that have had a positive impact in my life. Whatever the post may be, I always try to incorporate a positive message each and every time. Over the last couple weeks I’ve purposely put something out there in order to see what happens. I posted something or wrote something just to see what kind of a response it would get. For example, I posted the picture below challenging people to have a conversation with somebody new each day. Unfortunately, I think the conversation stopped shortly after I posted it. 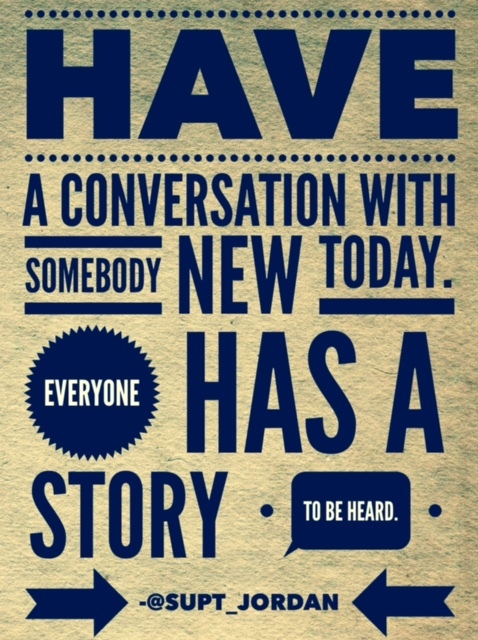 Everyone of us has a story that needs to be heard. I also sent out an “I Appreciate You” tweet and challenged people to retweet and show someone that you appreciate them. Each time I write an inspirational blog I invite people to share it. I don’t make money from my blog. I’m not out to brand my name. I write simply because it feels good and I continue to be encouraged to do so. But dang it, it feels really good to be appreciated, and you have the power to make this happen for someone else. Two weeks ago I invited three students into my office and shared an idea with them. I wanted to start a chain reaction of appreciation. I wanted it to be student led, and let their creative minds run with it. They came up with an idea to put “You Are Appreciated” signs on cars and asked the person that received it to pass it on to someone else. The students did a phenomenal job and put quite a bit of effort into this campaign. I’m grateful that they stepped up to do something right. I’d like to personally thank and recognize these three students from Griggs County Central. Jachob Rosin, Nicole Samson, and Alicia McCardle – thank you for all of your hard work. I can’t help but be disappointed with all of this though. I understand the concept that if you changed one life it was worth it, but I think we can do better. Please listen to me for a second though. IT TAKES LITTLE EFFORT TO MAKE A BIG DIFFERENCE. Click the share button, the retweet button, or just simply smile at someone and say hello. Send an appreciation note. If nothing else, do one nice thing each day for someone else. It’s actually quite simple. I’m not saying society is horrible. I’m not saying the world is getting scarier. I have a voice inside my head that continues to tell me to be a change agent in this world. Make life better for someone else. I’m in an excellent position to do so and so are you. I completely get that we get caught up in our own lives. I understand that. What most of us don’t understand is that we take for granted all the blessings we have in our lives. We don’t think about how the world would be different if we didn’t have them. We wake up in the morning and often times repeat the same routines throughout each day. Add something to your routine today and every day that follows….a random act of kindness. This is all I ask. This is what Rachel Scott was saying when she wrote the quote from above in her journal. Rachel has started a chain reaction that has inspired and saved lives. For more info about a wonderful program that has been created in her name please visit http://www.rachelschallenge.org/ What will your impact be? What will you do to make a difference? I challenge you to share one or more of the images you see on this blog or share the entire post. Challenge others to do the same. Take a second out of your life, to make a world of difference in someone else’s. I will stop writing blog posts when the little person inside my head settles down. We have bonded like none other for the last eight months, however I wish he’d agree to bond during daylight hours. I have stepped outside my comfort zone. Are you willing to do the same? I dare you..double dog dare you….triple dare you with no sticky tag backs. What are you waiting for?